Emits a modified function call graph. The function call graph is modified by removing all vertices whose function names match a user-specified pattern and compensating by listing the names of removed functions in the vertices of the callers. This is a little bit like inlining, thus the name of the class. 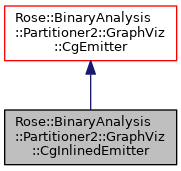 Definition at line 832 of file GraphViz.h.